The Cold War, an international chess championship, political relations between The United States and The Soviet Union, spies, friends, enemies, lovers, enemies who become lovers… it’s all going on at Tidewater Players in their latest offering, Chess, with Music by Benny Andersson and Bjorn Ulvaeus, and Lyrics by Tim Rice. All this fodder and music by the dudes from ABBA can’t go wrong and, wherever you stand on Chess (some love it, some hate it), there’s no denying that Director Mark Briner, Music Director R. Christopher Rose and Stephanie Carlock Cvach, and Choreographer Bambi Johnson knocked it out of the ballpark with this better-flowing, energized concert version that tells the story completely and cuts out all the muddle. Set Design by Director Mark Briner is smart and minimal and pulled this piece together nicely. As this production is more of a concert version, a large, lavish set was not needed, but a few levels and, some chairs and music stands did the job just fine and didn’t clutter the stage allowing for the superb staging and choreography to be showcased. Thomas Gardner’s lighting design is, in a word, splendid. His use of colors, isolated lighting, and blend of cool and warm tones helped tell this story and kept the piece energized and interesting throughout. He knows his stage well and lights it beautifully, adding great value to this production. Choreography by Bambi Johnson is impeccable. She knows her cast and the ensemble shined in each number. Upbeat, high-energy, and tight, the impressive choreography was engaging and kept the audience interested. From the smooth ballet to the rockin’ pop moves, this original choreography inspires. Music Direction under R. Christopher Rose and Stephanie Cvach is superb and it seems quite easy with the exquisite voices with which they have to work. A small band including R. Christopher Rose on Piano, Stephanie Carlock Cvach on Keyboard, Will Poxon on Percussion, Helen Slaich on Reeds/Clarinet, and Greg Bell on Bass Guitar fill the theatre as adequately as a full orchestra and each number is polished and well-performed. Kudos to Rose and Cvach for an impeccable job. Director Mark Briner is to be applauded for his efforts in bringing this production to the stage. As I stated, Chess is one of those shows that people love or people hate, for the most part. I’m in a small percentage that is in between where I love the music (how can you dislike anything from the dudes from ABBA?… don’t answer that), but I’m not very fond of the book. Since this is more of a concert version, the book has been cut to a minimum and the concentration is on the music which works brilliantly for this piece. Briner’s staging is tight and refined and the pacing is just about perfect. A mix of blocking and choreography brings it all together beautifully and makes for a very entertaining evening of theatre. Moving on to the performance of this production, I’d be amiss not to mention that the entire ensemble of this piece give top notch performances and all should be commended for their work and effort to make this a stellar production, a whole. Eileen Aubele and Barbara Hartzell are marvelous Svetlana Sergievskaya and Florence Vassy, respectively. Hartzell excels in this conflicted character, portraying that conflict in delivery of dialogue and physical gestures and great chemistry with her cast mates while Aubele, who comes in later in the piece, makes the most of her stage time with a poised presence and good hold on her scorned, but seemingly forgiving character. Vocally, both actresses are powerhouses and fill the theatre with a smooth, booming sound and harmony as in numbers like the poignant “Someone Else’s Story” sung beautifully by Hartzell, and the powerful duet, “I Know Him So Well.” Aubele and Hartzell are to be celebrated for their performances. Taking on the role of cocky International chess champion (and former champion) Frederick Trumper, Rob Tucker is a highlight and shines in this production. He embodies this character and portrays him with just as much pompousness as required and his transition in his character is seamless from beginning to end. Vocally, Tucker is superb which he showcases in his strong and confident performances in numbers such as the popular, high-energy “One Night in Bangkok” and the emotional “Pity the Child.” Tucker is certainly one to watch (and you can’t help but to) in this production. Rounding out the featured cast is standout Shawn Doyle, taking on the multifaceted role of Anatoly Sergievsky. Doyle has performed this role numerous times but it’s as fresh as ever. He understands this role inside and out and he gives a consistent and exquisite performance. He portrays the conflict, confusion, and hurt that is required of this character and gives a vocal performance that is excellent, to say the least. His renditions of the duet “You and I” and the Broadway standard, “Anthem” is smooth, emotive, and resonates throughout the theatre making for a memorable and exquisite performance. Final thought… Even the cold war is over, Chess is still as relevant today as when it was released. This production is well put together and cuts what needed to be cut and still told the story in its completion. The performances are spot on and the entire ensemble is giving 100% effort. Staging keeps the audience engaged and interested and the music is performed near flawlessly. Admittedly, Chess is not on the top of my list when it comes to musical theatre, but it’s mainly because of the book. The music has always been the driving force in this piece and in this production is more concert-like making for an absolutely joyous evening at the theatre. Get your tickets now because this is not one you want to miss this season. This is what I thought of Tidewater Players’ production of Chess… What did you think? Please feel free to leave a comment! 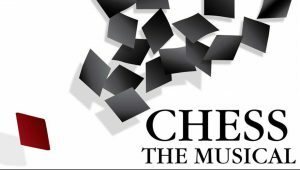 Chess will play through October 1 at Tidewater Players at The Cultural Center at the Opera House, 121 N. Union Street, Havre de Grace, MD. Purchase tickets at the door one hour before show time or purchase them online. It was Mrs. Peacock, in the Conservatory, with the Candlestick!… Or was it? If you understood that reference instantly, you, like many, many others, are familiar with a certain board game aptly named Clue in which one must use his or her powers of deduction to solve a murder. This board game has also spawned a highly successful and oft quoted 1985 film of the same name, and stage musical adaptation, and many parodies through the years. 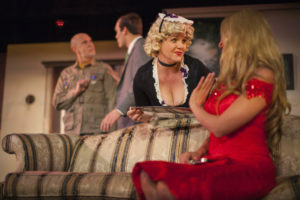 Included in these adaptations is Tidewater Players latest offering, the new and original Without a Clue by Mark Briner, who also puts on the hat of Director. In a nutshell, Without a Clue is a parody based on the board game Clue! and cleverly incorporates pop culture both past and recent. Five guests, Mrs. Peacock, Colonel Mustard, Professor Plum, Mr. Green, and Miss Scarlet are invited to the palatial home of Mr. Boddy for dinner and, what they are led to believe, a beneficial financial opportunity. Once settled in with the help of Mr. Boddy’s staff, Ashe, the able Butler, Mrs. White, the begrudged maid, and Violet, the not-so-bright French maid, Mr. Boddy wastes no time in revealing the actual reason of the invitation… blackmail. Mr. Boddy is planning on blackmailing each guest for certain indiscretions and makes no bones about it. The guest, fed up with Mr. Boddy, and his crazy plan decide to leave but, as they do, the power goes out and Mr. Boddy is quickly taken care of by the way of a gun and the search for the killer begins and every person in the house is considered a suspect. By the end, it’s up to the audience to point out the murderer… if they’ve been paying attention! Set Design by Dickie Mahoney and Mark Briner is smart and simple rolling walls and individual set pieces. With only one level to work with in the new and improved space at The Cultural Center at the Opera House, and many different locals written in the script, Mahoney and Briner’s design is easy to transition and effectively represents each location within the story nicely, adding great value to the production as a whole. Along with Set Design, Mahoney and Briner also take on the responsibility of Costume Design and this design, like their Set Design, is spot on. Each character is appropriately represented whether in full color (as is Miss Scarlet and Mrs. Peacock, which we find out is actually just blue), or a splash of color, as for Mr. Green with his green tie or Colonel Mustard with his yellow or mustard colored ascot. The staff is traditionally dressed in maid uniforms and a tuxedo for Ashe, the Butler. Mahoney and Briner clearly takes time with their design with attention to detail that makes it all the more aesthetically pleasing and authentic. To round out the production team responsibilities, Mark Briner, who authored the piece, takes on the helm and places the Director hat on, as well. In some cases, it can be risky to have the author direct his or her own work, but in this case, it seems to have worked out beautifully. He keeps the pacing consistent with his staging and has guided these actors to delightful performances of the characters he has crafted. As the author, he has a complete comprehension of the story and the humor of one-liners and wise-cracks. His understanding of farce is well apparent in this upbeat and frenetic piece. There is a bit at the end of the production when the audience is supposed to vote on who the murderer is and the actors are assigned a section of the theatre to collect votes but the way this is done is quite chaotic and haphazard. The actors simply yell out to the audience to vote by raising their hand when the character they believe to be the killer is called out. With six or seven actors yelling out names and trying to adlib, it can become a bit overwhelming a loud. I get the whole audience participation bit, but perhaps this can be tweaked for future performances. However, screaming actors aside, Briner has done a superb job with this production and is to be commended and applauded for his hard and diligent work creating and bringing this slice of witty and clever theatre to life. Moving into the performance aspect of Without a Clue, Eric Brooks takes on the role of Mr. Boddy, the host of the evening and not the most popular kid at the party. Brooks is a bit scripted and sounds more like he’s screaming rather than having a conversation, but he pulls the role off adequately. Where Brooks shines is in his performance as the fed-up, over-dramatic, and comedic Chef Bleu with this grand gestures and impressive French accent. Along the same lines of an actor performing an unnamed role a bit better than the named role (according to the program) is Allyson Sands who portrays Violet, the ditzy French maid who can’t seem to find her way to the kitchen, and the new, psychic neighbor, Madame Rose. Sands has a good grasp of comedic timing and her portrayal of Violet is on par, but it’s her turn as Madame Rose that adds value to her performance. Her timing is on point, as well as her accent for this character. Sands has a good command of the stage and seems comfortable in these roles making for a strong performance. Tom Hartzell tackles the role of the seemingly perverted Professor Plum and, though he seems to have a good comprehension of his character, his performance falls a bit flat. He certainly has issues in his delivery of the material as he trips over most of his lines, losing the momentum of the fast-paced piece. He seems scripted and uncomfortable most of the time, but he is believable as this sorted character and has a good chemistry with his cast mates. Taking on the role of the suave Mr. Green, Chris Volker gives a respectable performance but also has some trouble with his delivery of the text. Scripted and a little stiff, Volker seems to be going through the motions of this funny, sleazy character. That being said, he does give a dedicated performance and keeps the energy up throughout. He works well with and off of his cast mates and makes the role of Mr. Green his own. Rounding out this motley crew of guests is Phil Hansel as Colonel Mustard and Michele Guyton as Mrs. Peacock and Denise Rogers Mylin as Miss Scarlet and all give admirable portrayals of their characters. Hansel’s portrayal is a bit befuddled but that could very well be the way the character is written and he does have good comedic timing that makes his character almost charming, in a way. Michele Guyton’s portrayal of Mrs. Peacock (my favorite character in most of the adaptations) is not without its flaws but is a commendable performance. Her southern accent comes and goes, which ends up being a distraction, but her comedic skills are spot on and she delivers some great zingers throughout the evening. It just seems as though Guyton is trying too hard to caricaturize Mrs. Peacock and portray her as the “funny, sassy drunk” and it all seems forced. The trick in a character like this is to play it seriously and trust the dialogue and situations will invoke all the comedy that is required. However, aside from these minor issues, Guyton gives a splendid showing and praiseworthy performance. Justine Quirk as Mrs. White. Credit: Austin Barnes. Definite highlights of this production are Greg Guyton and Justine Quirk who tackle the roles of Ashe and Mrs. White, the poor senior staff of the manor and the ones who try to keep thing manageable. Greg Guyton is perfectly cast for the role of Ashe and he completely embodies this character, keeping him consistent throughout. His delivery is near perfect and his character choices are absolutely appropriate. He has a strong presence and a knack for improvisation, as demonstrated when he breaks the fourth wall to stall for time as the audience votes are being counted. His pacing is near flawless, notably, his recap of events at the beginning of Act II. Guyton’s instincts and dedication to the character make for an outstanding performance. Justine Quirk, as Mrs. White, is absolutely believable and she is probably the keenest with comedic timing and crystal clear delivery. Because of her style, she reminds me of Jackie Hoffman (of Broadway and Feud: Bette and Joan fame), one of my favorite current actresses of stage and screen. 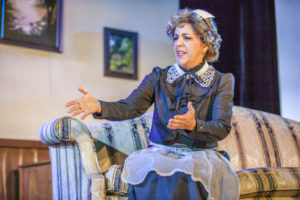 Quirk has a complete grasp of the humor of this piece and her portrayal of the begrudged servant is impeccable as she is able to take the role seriously enough to up the comedy of the character. Her delivery and instincts even make the touch of unmitigated, over-the-top melodrama digestible and funny. Her skillful portrayal make for a standout performance and certainly a joy to watch. 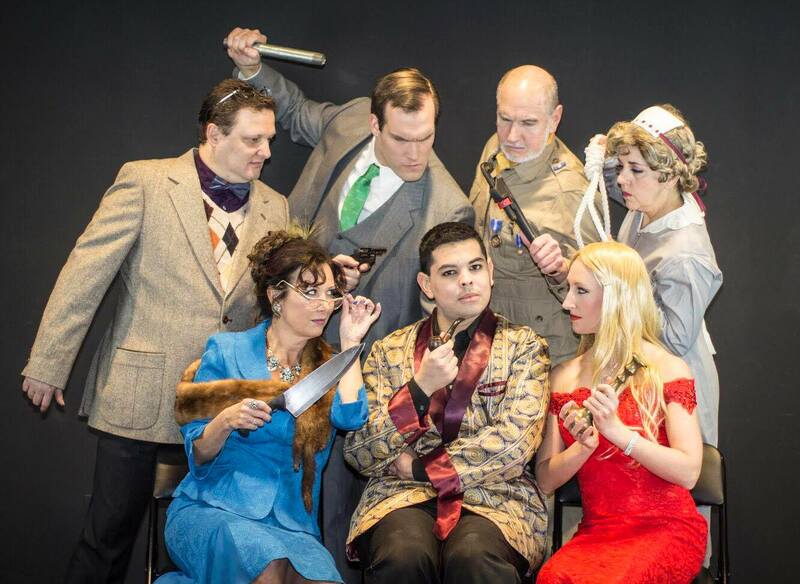 Final thought… Without a Clue is a witty, cute, and nostalgic slice of theatre incorporating familiar games and pop culture into a delightful, zany evening of intrigue, comedy and fun for all! It’s very reference heavy, as all parodies should be, so you’ve got to pay close attention to catch them all, and though some references may be more obscure than others, it’s still a delightful evening of theatre. A majority of the performances are top-notch and the pacing and staging is on point and swift making the two and a half hour run time feel less than it actually is. With a little tweaking of the script, this piece is going to be near flawless and Mark Briner is to be applauded for his efforts in both script and direction of this world premiere production. Get your tickets for the weekend as you don’t want to miss this one. 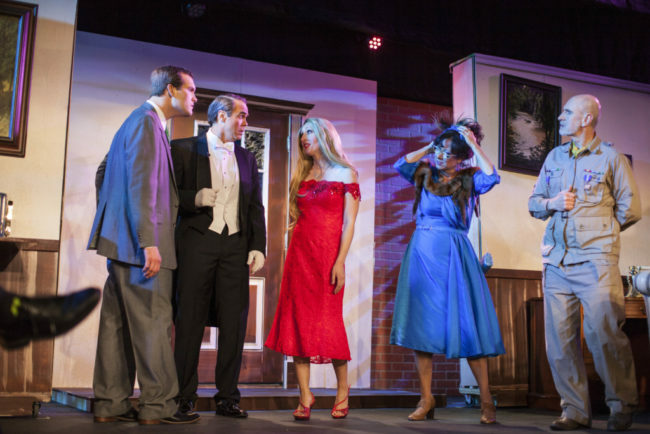 This is what I thought of Tidewater Players’ production of Without a Clue… What did you think? Please feel free to leave a comment! Without a Clue will run through March 4 at Tidewater Players, The Cultural Center at the Opera House, 121 N. Union Avenue, Havre de Grace, MD. For tickets call the box office at 667-225-8433 or purchase them online.